We are a company focused on providing Secure Technological Turnkey Engineering Solutions to South Florida market. We specialize in Hi End Enterprise IP PBX – UCC – Secure Communications Projects, CCTV IP Cameras & Video Surveillance, Structured Cabling, Wi Fi Networks and Access Control. Techno IP Solutions was incorporated in 2003, specializing in design and implementation of Low Voltage Projects. Our customers include Private Developers, Government Housing Developments, government agencies at the state, local and federal level, educational institutions including K-12 and colleges and universities and private businesses. Our staff includes Certified Electrical, Mechanic, Civil and Communications Engineers. We have the credentials and experience to satisfy the most demanding clients. Among our experiences we can reference jobs as large scale designs and development of Communications, CCTV, Wi Fi, Access Controls and Gated Systems. Furthermore, Techno IP Solutions is committed to quality resulting in a system that exceeds industry standards and always meets your expectations. We have specially designed, Professional turn-key solutions for Corporates, Schools, Banks and Government segment, based on our Private, Secure, & Encrypted systems. We provide professional video surveillance solutions with 5 years warranty and support of the manufacturer. We represent Dahua Technology for Video Surveillance Solutions. 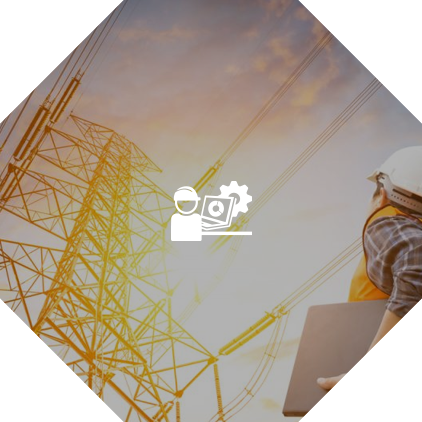 We take you most complex wireless broadband challenges and provide custom solutions that are certifies, protected and prove. Our team of mangers & estimators are ready to help you design your cabling system to meet your current & future needs. We have over 7 years of experience. 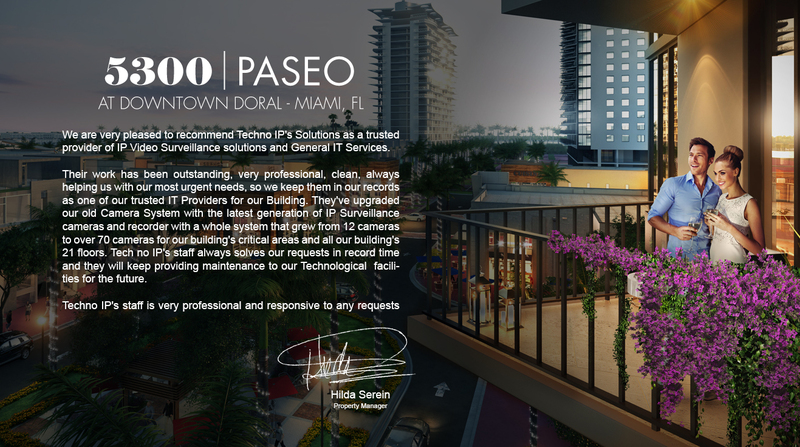 TECHNO IP establishes alliances with Florida’s leading general and electrical contractors, architectural firms, property developers, and real estate agencies to provide Technological Secure and Structured Cabling Solutions for high-profile building projects. In order to deliver the highest level of products and services, TECHNO IP has established a network of strategic alliances with the industry’s leading manufacturers, distributors and solution providers. 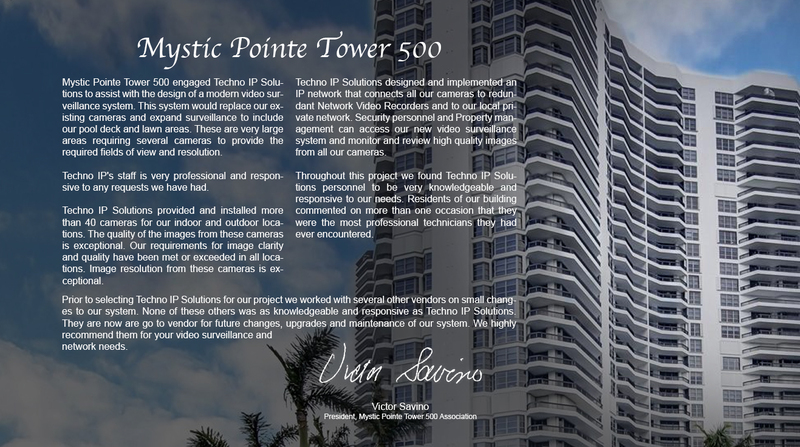 We service Doral, Miami-Dade, Broward County, West Palm, Fort Lauderdale, Brickell Florida USA Solutions: Category 6, Wire, Cable, Data, Fiber Optics, Security, Industrial, Commercial, Buildings, Apartment Buildings, HOA’s, Condo Corps, Warehouses and Shopping Complexes. 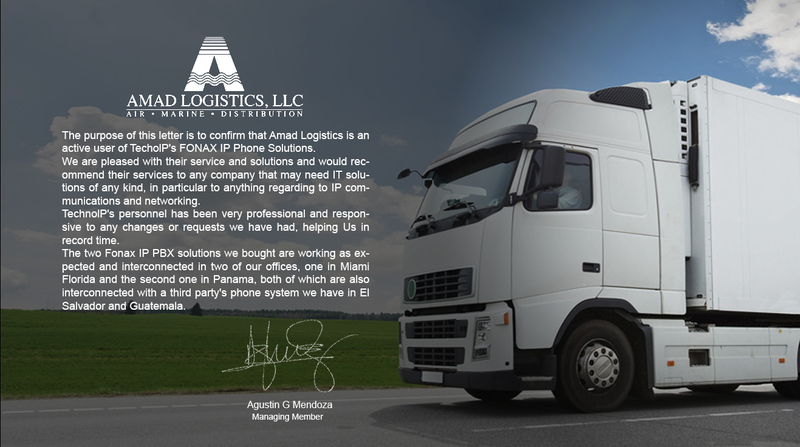 4995 NW 72 AVE, SUITE 205, MIAMI, FL 33166, USA. 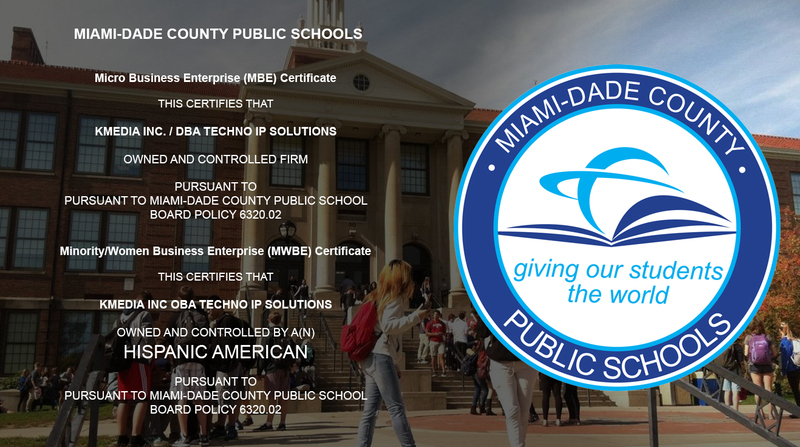 We services Miami Dade, Broward and Palm Beach Counties.